Audience: Runners and Therapists Purpose: A quick guide to running injury prevention. Preamble Injury prevention for runners is not rock-solidly founded in science… and may not even be possible. With runners it is more injury management. You are going to get injured and you are going to have some aches and pains. The ideal is to minimize your lost training time and avoid some of the nasty injuries that can jeopardize your long term running and goals. As I said, injury management is not a science. What works for one person often does not work for another. Unfortunately, there are few strong statements that we can make about injury prevention. If a therapist tells you that you must do “x” to prevent injuries then for the most part they probably don’t know what they are talking about. Injury prevention articles tend to glom onto whatever is fadish (e.g. core stability, dynamic warm ups, stretching, minimalism). All of these may play a role but there is certainly no absolutes. This article will be some opinion that is informed by some research. All of the suggestions can help some of the time. We can roughly categorize injury factors into extrinsic factors (something outside of yourself) and intrinsic factors (things about you). Injury Prevention cheat sheet: I have attached a pdf file simple running injury prevention sheet oct2012 that is a general overview of injury prevention for runners and some exercises that may be helpful. For therapists, please feel free to use this for talks for different athletic groups. Runners are NUTS. We just want to run…all year round. What other sport does this? Sports have seasons, sports let you prioritize different aspects of your training throughout the year. Sports have off-seasons, pre-seasons and competition seasons. We need this too. So what can you do? Get a good, progressive running plan. Follow it. Don’t do too much too soon. Those three pithy sentences are everything you need to prevent injuries…for the most part. What are the basic elements of a good plan? Sometimes you need to ignore number one. I just advised that you follow a specific running plan of whatever coach you fancy. Unfortunately, many plans are not tailored to you but are designed for the average plus/minus a standard deviation about said runner. If you are feeling beat up and getting injured than you need to modify the program. Don’t feel bad about this. We are all different and should not expect everyone to do the same thing. Having an experienced coach can really help you through this. This is why I recommend coaches (a la Nicole Stevenson) or some very great instructors who are also great athletes at different running programs. 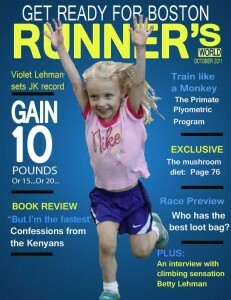 Click here for a great running blog from a Running Room instructor who is also a great runner. This is really about overtraining. If you are not able to make your prescribed work out times, are consistently feeling run down, ache all over and ache specifically during runs then maybe you need a mini-taper. Just a 3-7 day volume and pace reduction to get you charged up again. Talk to your coach and listen to your joints. Shoe science ain’t no science. Your feet and body tell you what feels good. 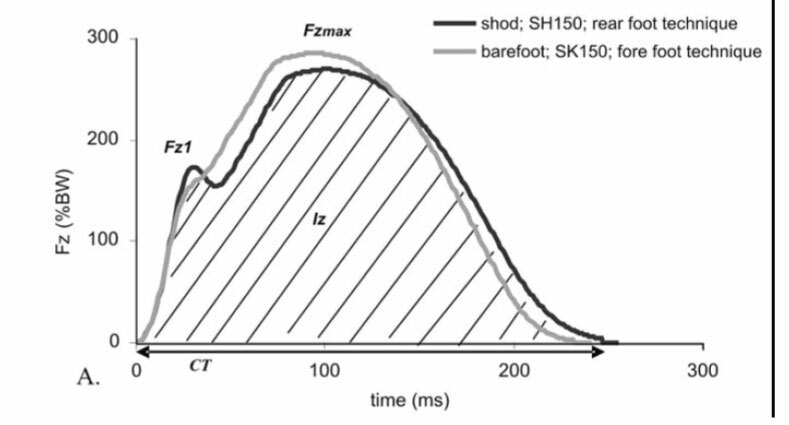 Read below for more on footwear, foot striking and barefoot running. Your body is an adapting machine. Pro athletes are not only stronger and faster than you. They can also recover better. Their bodies are better at adapting to the strains placed upon them. If they get injured they adapt faster. When they train hard they adapt and are ready to handle that new load. You need to optimize your body’s ability to adapt. Here are some suggestions and I repeat, they are not hard and fast but work for many people. d. Treat yourself to someone else’s hands on you (try Physio, Chiro, Massage). All of these things (name a technique – ART, Graston, Fascial Manipulation, joint manipulation) can help some people some of the time. I often look for minor dysfunctions (or at least what I presume to be a dysfunction which is still a murky construct) in joints before pain has reared its head in an attempt to prevent future problems. The vast majority of pro athletes will have this type of manual therapy work done regularly. You may or may not need it – try it but beware of hard sales and any catastrophizing on the part of your therapist. A lot of therapists will take an x-ray or perform some scan that tells them how incredibly dysfunctional you are and if you don’t get several treatments for a prolonged time you will be ruined. This is poppycock. Avoid these people. No one is that effed up. 6. Did I mention follow a good training plan. 1. Anatomical or structural things about your body are WAY overrated. Knock knees, flat feet, high arches, wonky hips, scoliosis, femoral anteversion. These are all things you can do nothing about and also have no relationship to injury. Please don’t worry about this and don’t let some one tell you they can correct a problem that is not a problem. This is catastrophizing and worthy of your disdain. 2. Orthotics – not really intrinsic but they still try to affect you. I have a huge ambivalence towards orthotics. The research behind their prescription and the rationale for what they might do is rather weak, conflicting and often does not follow common sense. Yet sometimes I use them with patients (very rarely) and have patients that swear by them. I know marathoners and Ultra runners that absolutely feel that they need them to function (whether this is a good thing or is another problem that should be addressed is another issue). My bottom line with orthotics is that they are not magic, they may help you as they have helped others and there is no certain way of knowing whether you will respond fantastically to orthotics. All of the assessment tools that are typically used for the prescription of orthotics have not been sufficiently proven. That being said they may be worth trying. If you read this paragraph and thought that I said a lot without saying nothing you may be correct. So popular now. So popular to hate it and so popular to love it. The hate comes from decades old research suggesting that acute stretching decreased (transiently) the strength and neural drive to muscles during explosive or high intensity exercise in relatively simple exercises (e.g. vertical jump). This loss of strength was not found in some complex exercises (e.g. kicking a soccer ball) and I was unable to reproduce a loss of velocity in some preliminary research looking at the golf swing. There is also a great deal of research suggesting that stretching before or after exercise has no injury prevention effect (but no harm effect as well). As for running there is some research that suggests that stretching immediately before running makes you less efficient. Alex Hutchinson’s blog (sweatscience.com) really illustrates these studies…but there are previous studies and current research that does not agree with this work. Additionally, there is some research that suggests that if you do a warm up after you stretch then this takes away all of the negative aspects of stretching. Having more flexibility or lacking flexibility is not consistently related to any injury related to running. My opinion on this one is that this must be taken on an individual basis. If you are constantly getting injured and have flexibility deficits (relative to your peers) or have asymmetries between sides of your body than maybe you need to work on this. If you are relatively injure free, have never stretched then why should you start? Because some physio told you to…don’t bother. A quick qualifier, if you are reading this as a therapist and want research to support this, I have nothing. Stretching does not change muscle stiffness, it only allows you to tolerate more muscle stretch. In my opinion, I can’t rationalize every runner starting a stretching program. That being said if you love stretching and it works for you then please do not stop. Yes, please do. Prepare yourself for your run. Move your limbs and body in a manner that will be required during your sport. Start slowly and progress. This is a warmup. Easy, no? Start running slow and build to speed. Do form drills (As, Bs, Cs), Do strides, Do Skip, Do Shuffle, Do Carioca, Do Backward running. Swing your legs back and forth and side to side. Swing your trunk around. There, that is warm up. Please note, some of these links are dead as I lost a lot of articles with some sort of spam infestation. f. The importance of balance and proprioception exercises. 1. Stride Cadence: at speeds greater than 6:00min/km you may want to be taking greater than 170 steps per minute. Count the number of times your foot hits the ground in a minute – it should be 85-90. Sprinters take upwards of 230 steps per minute. 2. Foot Strike: it may be more important to land with your foot closer to your body rather than what part of your foot touches the ground. The footstrike debate will not die because we do not know the answer yet. Here is a detailed post on foot strike mechanics. All of these factors are often associated with weak hip abduction strength, poor hip abductor endurance and knee and hip injuries. 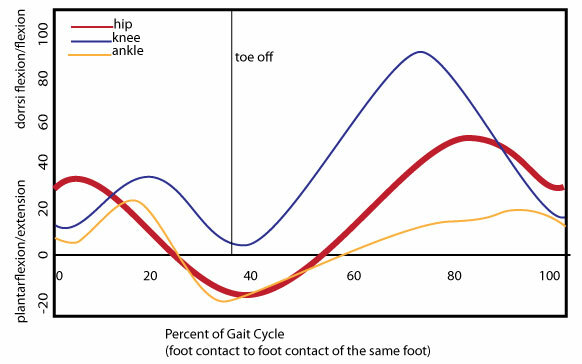 These variables are often theorized (but not proven) to be related to foot overpronation and possibly an excessive amount of anterior pelvic tilt. 4. 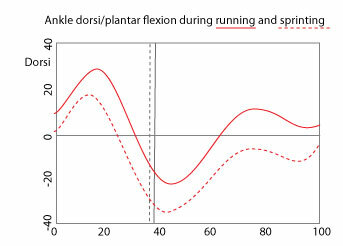 Pronation – we don’t know if this is a factor. 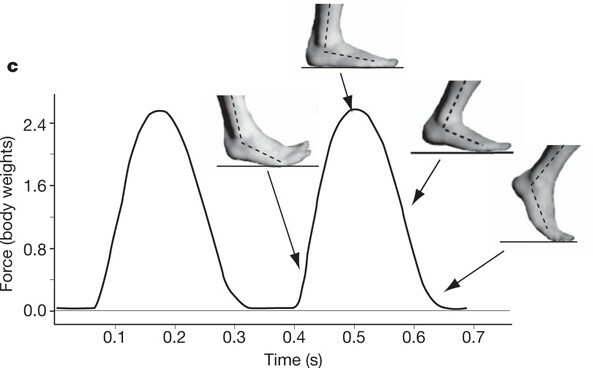 In some studies it is the speed of pronation that is related to injury. In other studies the lack of pronation can be related to some injuries. Correct this or attempt to correct it if you are having consistent injuries. I would be cautious of correcting (even if you could) this if you have no significant problems. 5. Impact loading – Run softer, seriously. If you can really hear yourself clomping the ground then try to run softer. Take shorter strides, even work on changing your foot strike for parts of your run. Elevated impact levels and often the rate of how fast you impact the ground are often related to injuries (specifically stress fractures). If you have a history of stress fractures look at your stride rate and how hard you hammer the ground. A very interesting area…but no world records and no elites are running barefoot. While our ancestors may have done this they did not live past our middle age. We know that impact loading is different in young runners than “old” runners so how do the benefits of barefoot running translate? My on the fence position is that there is no definitive research either way. Don’t through out your old clunky shoes but don’t discard the idea of adding some minimalist training into your work outs. For a review of the science please see here and here. If you have made it through this post please check back regularly. This post is a mere framework that I will be adding onto throughout the next couple of months. There are number of greater articles on other people’s blog posts that I have not linked to. I will also be reviewing the literature in a number of different areas in the next little while. Limitations: Many of us assume that there is one right and better way to run. Deviations from that ideal are assumed to lead to injuries and decreased economy. This is still a debatable concept. Everything I write can be questioned so please do so. I wanted to highlight some probably beneficial components of her running gait. Future posts will look a deviations from this gait and how they might relate to injury. - foot strike is midfoot with one odd exception. When running at higher speeds she tends to heel strike on the left. Interesting, Nicole has had some achilles problems on the left. -the arms do very little in terms of driving forward. We should surely question the role of the arms in producing power. They do not do this. Nor do they significantly tension the thoracodorsal fascia and some how stimulate the opposite Glutes to fire. The glutes fire because we are driving our leg back to the ground. There is no evidence that the arms are required in this. One misquoted and abused paper by Mooney et al (2000) does not support this idea. 1. Pain is a perception. Signals (e.g. nociception or even pressure) come from the body and the brain creates an output that we perceive as pain. Ever heard of a soldier being shot and not feeling any pain until they were safe and out of harms way? If pain was some absolute thing that the brain has no choice to recognize than you would have no way but to feel pain any time a tissue was injured. We've all heard stories of people being injured but feeling nothing. 2. Your body does not have to be injured to feel pain. In fact you can lose a limb and later feel pain in that limb that no longer exists. 3. Tissue injuries (e.g. disc bulges, rotator cuff tears, tendinopathy) do not have to hurt. The body can have lots of so called "dysfunction" but this does not mean that you will feel pain. For example, 50% of people over fifty may have a rotator cuff tear but they experience no pain. 4. Emotions, beliefs, stress, past experiences etc can influence the pain that you feel. Pain is more than a punch in the arm. 5. The perception of pain can move around in your body and this does not mean that you are crazy. This is a normal finding when we experience persistent pain. 6. Pain changes how we move and how we function. Movement is often the key to resolving pain. There is so much more than this but I will let the resources below provide better information. 1. Neurotopian: Pain for Dummies a great site, you can read this and ignore everything I say. 3. Peter O'Sullivan explains how our fears and beliefs about our backs change how we move and contribute to the feeling of pain. Audience: RunnersPurpose: To give a pictorial basic background into the movements that occur in the sagital plane (i.e. 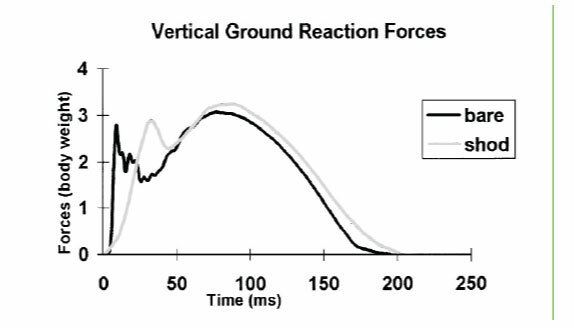 looking from the side) of the lower extremity during running at 3.1 meters/second (about a 5 minute km) and "sprinting" at 3.9 meters per second (about a 4.17 minute km). Sprinting is the dotted line in the graphs below. Source: The following graphs have been adapted from Novachek (1998). It should be noted that there is some variability between studies. 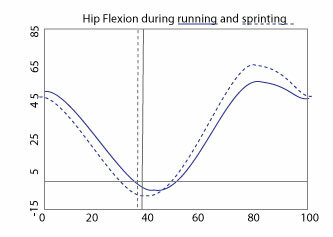 I would note that there is certainly some other research suggesting that hip extension does not increase with running speed (or even when going from walking to running). While it may look like the upper thigh is bent further back when watching someone the actually movement is coming from an increase in the anterior pelvic tilt of the runner rather than from the hip extending backwards. View these graphs as a schematic representation and understand that there is some differences across people. If you like numbers: The knee is flexed about 25 degrees when the foot hits the ground, will flex an additional 20 or so degrees while it bends, it will then straighten to about 10-15 degrees shy of being completely straight and then it will bend more than 70 degrees when you swing it through. 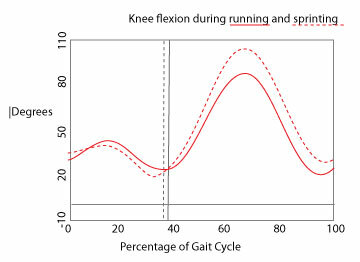 While the above graphs show the general trend for changes from running to faster running (albeit with some debatable hip function) the graph below brings together all three movements of the hip, knee and ankle. This graphs has been adapted from the work of Jay Dicharry at the UVA lab. The UVA lab is the same research group demonstrating how hip extension is not increased during running and how anterior pelvic tilt contributes to the thigh looking like it is further extended. In a cool study (Leskinen et al 2009) comparing elite 1500 metre runners with national standard runners (still fast) and running the same speed a group of researchers found differences in their running kinematics. 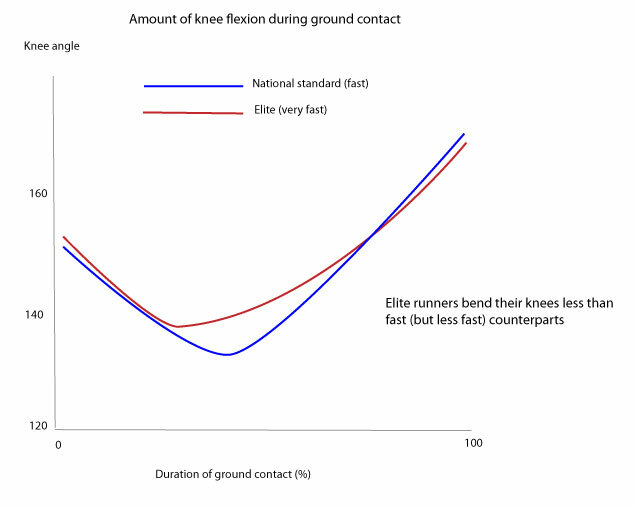 The authors found that the elite runners did not flex their knees as much during landing (i.e. stiffer knees) and that these runners flexed their hips faster. Stay tuned for more posts going into further detail on running mechanics.